Dhankar Monastery built at highest location in Spiti Valley (3870m) in 17th century was once the capital of Spiti. Its is one of the important Buddhist centres of the region. Dhankar is about 32 Kms from Kaza and is situated by the river Spiti close to the confluence of Spiti and Pin Rivers. Dhankar Monastery offers some amazing views of the Spiti valley. 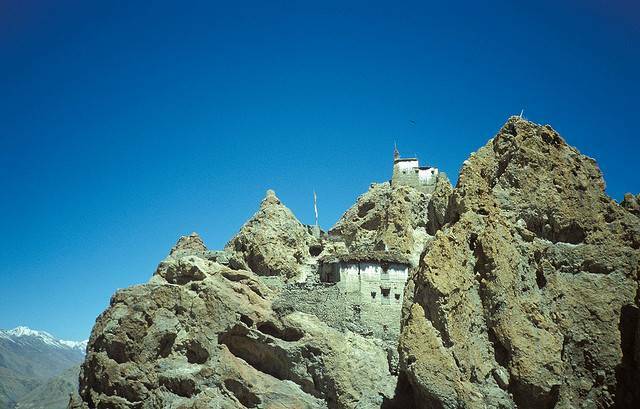 Dhankar Monastery or Gompa is so built that it is as grand as a fort. Monastery is also called Lha-O-pa Gompa. Dhankar lake is about 2.5 km from the monastery and is surrounded by snow laden mountains. Place is more famous among trekkers. Tabo Monastery is 26 KMs away from Dhankar and one can also visit Pin Valley National Park.